Cows Save the Planet | RANGEfire! Why do people outside of the farming community continue to lie about our industry? They romanticize and talk about loving the small family farmer, yet with every action they work at putting farmers out of business. Gov. Jerry Brown and the entire California Assembly dealt the latest blow to small farmers. That state’s “leadership” has just passed a law that dairy farms must reduce greenhouse gas emissions to 40 percent of 2013 levels and as a token of their appreciation, they are promising farmers the money collected as a penalty tax will “help” make it happen. Somehow they have convinced themselves that if we use this cap and trade money, gifting $50 million to dairymen, they can build digesters, capture gases and sell it to an energy company. Really what they have done is once again reduce the number of people on the land, managing the natural resources and converting them into the essentials of life: food, fiber, pharmaceuticals and fuel. Honestly, this entire problem could be fixed with a Great Depression and I am about ready for it. The bottom line of this story is really no different than others we discuss on a daily basis that involve the true disconnect between food producers and food consumers. A statement made on my recent Rural Route Radio program by freelance journalist and Vermont author Judith D. Schwartz put the entire matter in perspective. In a nutshell, she said people who live in a city have to go and visit nature. The men and women who live on farms and ranches never leave it. So for us to continually have bureaucrats, lawmakers and regulators telling us what is best for a healthy environment goes down about like milk enhanced with cockleburs. Schwartz, by the way, is for all practical purposes a city gal herself. She will tell you that despite living in “rural Vermont,” she has always been a city person. How a lifelong city girl ended up writing a book called “Cows Save the Planet” is a story in itself. The book was born from her study of economics in which she learned that money flows from rural areas to money centers. She also got really interested in how local economies matter. 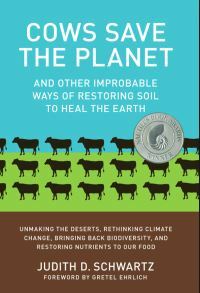 Schwartz attended a conference and when the statement was made that more carbon dioxide goes into the atmosphere from the soil than from burning fossil fuels, she decided to learn about soil and overall soil health. 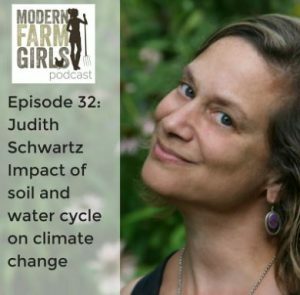 Schwartz quickly learned what I think most of us in the farm community already know and that is “everything revolves around soil health.” She also shared something with me that gets to the core of the general ignorance about nature that she has experienced. You cannot manage one aspect of nature individually and apart from the others. You need to manage the system as a whole. 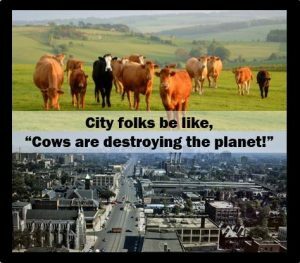 For example, California is taxing both dairy cows and landfills thinking they will make a difference without consideration of the cycle of life in its entirety. This is where I would normally quote great research and scientific verification that cows are part of a healthy planet instead of just a part of the problem. Instead, let’s just take a step back and look at what cows do. They consume cellulose material that, if uncontrolled, provides fuel for fires until it is broken down through decay. A cow accelerates the decay by eating, digesting and then reapplying nutrients to the soil in a form that plants can use. In the process, the cows make milk, protein, fat, tires, cosmetics, lifesaving pharmaceuticals, clothes and so much more. So in layman’s terms, how on earth can anybody make the case that the cow does anything other than “save the planet”? Yes, our jobs as humans are quite simply to manage the cows (or other grazing animal) so they are in the right spot to continue this process over time. 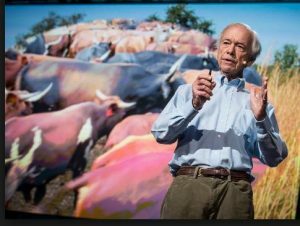 Schwartz came to this conclusion rather quickly when she discovered Allan Savory and his concept of fighting desertification and managing climate change. While we understand our climate will continue to evolve, we should do our best to manage it in a way that is beneficially to everything involved. At the end of the day, God provided all of these resources for us to utilize and manage to the best of our ability. When done properly, the outcome can improve both the planet and human health. Demonizing one of them was never a part of the plan from above. I believe that likely happens farther south. Editor’s note: Trent Loos is a sixth generation United States farmer, host of the daily radio show, Loos Tales, and founder of Faces of Agriculture, a non-profit organization putting the human element back into the production of food. Get more information at www.LoosTales.com, or email Trent at trentloos@gmail.com. Ya there’s some socialism being payed/played. The Fact Always Remains that the Globe’s Best Decisions are Always Made Under The Shade of a Cowboy Hat.